Ruby-throated Hummingbirds and Cardinal-flower – A Perfect Partnership! From late July to early September, Cardinal-flower’s brilliant scarlet blossoms beckon to thirsty little Ruby-throated Hummingbirds like a neon sign to a hungry traveler, promising a long satisfying drink to this industrious bird. Hummingbirds can’t resist bright tubular flowers that are shaped to accommodate their long narrow bills and tongues, a design that allows them to access the bounty that is out of reach to less compatibly designed diners. Each Cardinal-flower (Lobelia cardinalis) plant has a tall cluster of flowers that bloom around a central stem. In order to maximize the chances of successful pollination (and by happy coincidence, our viewing pleasure), Cardinal-flower stages the opening of its flowers over a period of weeks. Blooming begins with the lowest buds on the stem, gradually moving up until all the flowers in a cluster have opened for business. Ruby-throated Hummingbirds will likely be regular visitors throughout this process. But the Cardinal-flower expects something in return from the Hummingbird for its gift of nectar. The unsuspecting little bird carries out an essential service for the Cardinal-flower: pollination. When the Hummingbird inserts its bill in the center of the bright red corolla to drink, the top of its head is snugly brushed by a long tube that arches above the flower’s scarlet lobes, the flower and the Hummingbird fitting so perfectly together that it looks like a custom tailoring job. In newly blossoming flowers, the tube is tipped with a fused set of pollen-rich stamens that brush the Hummingbird’s head, leaving a precious cargo of pollen for the little bird to take to the next Cardinal-flower it visits. In the picture above, you can see the yellow pollen at the tip of the stamen resting on the Hummingbird’s head. As the flowers mature, the stamens are succeeded by the flower’s female parts, called pistils, which are now perfectly positioned to receive the pollen transported to them on the head of a Hummingbird. As a plant matures, it will likely have flowers in their female stage lower on the stem, with flowers higher on the stem in the male stage. In the photo above, the flowers on either side of the Hummingbird are lower on the plant’s stem than the one from which the Hummer is drinking, and they have matured enough to be offering the reddish stigmas as pollen receptors at the tips of the pistils. The little bird drinks systematically from the lowest flowers in a cluster to the highest, bringing the pollen acquired from the male flowers of one plant to the female flowers of the next. This helps increase the likelihood of cross pollination, which will result in genetically stronger offspring. In between visits of the Ruby-throated Hummingbird, keep an eye out for butterflies. Cardinal-flowers don’t offer much of a landing platform for pollinators, since their perfect partner, the Hummingbird, hovers and doesn’t need one. (Why invite freeloaders?) But Swallowtail butterflies are also willing to put forth the effort to grasp the tenuous flower platform and hover for a drink. Spicebush Swallowtails like the one pictured below seem to be especially drawn to these flowers. From the Cardinal-flower’s perspective, however, they are a much less effective pollinator. The butterfly’s anatomy is not so perfectly tailored to acquiring and distributing the pollen of this plant, so successful pollination by a butterfly would be much more random. Cardinal-flowers depend on Ruby-throated Hummingbirds to effect pollination and continuation of the species. In return, the Hummingbirds depend on this reliable nectar source. Cardinal-flower can grow to a height of three feet, and will tolerate sun to light shade. Although it prefers moist soil, established plants usually do well even in hot, dry summer weather. This gorgeous gaudy plant with its bold blossoms is a wonderful way to entice Ruby-throated Hummingbirds to visit your garden. 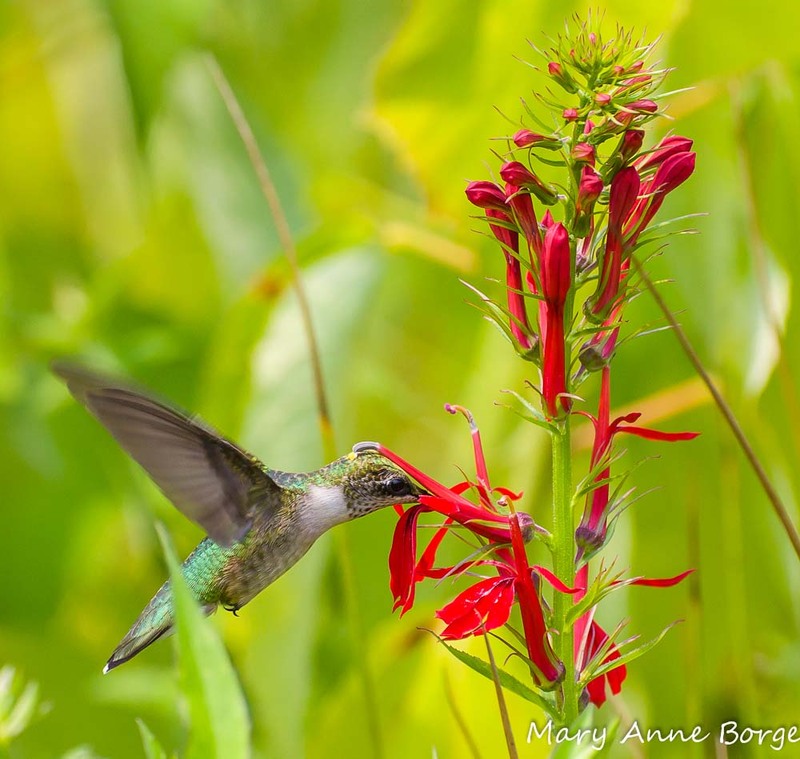 This entry was posted in Birds, Butterflies, Gardening for Wildlife, Native Plants and tagged Cardinal-flower (Lobelia cardinalis), Lobelia cardinalis, nature, Ruby-throated Hummingbirds by Mary Anne Borge. Bookmark the permalink. Cardinal flower is perennial in effect only. No part of the flower in bloom returns the following year. New plants grow around the base of the flowering stem but are not a part of it. As is the case with herbaceous perennials like Cardinal-flower in the areas where they are native, its above ground parts die back each year. The next year, new shoots are sent up from the root system. In the case of Cardinal-flower, it may be a clump-former, meaning that multiple shoots may be sent up over time. 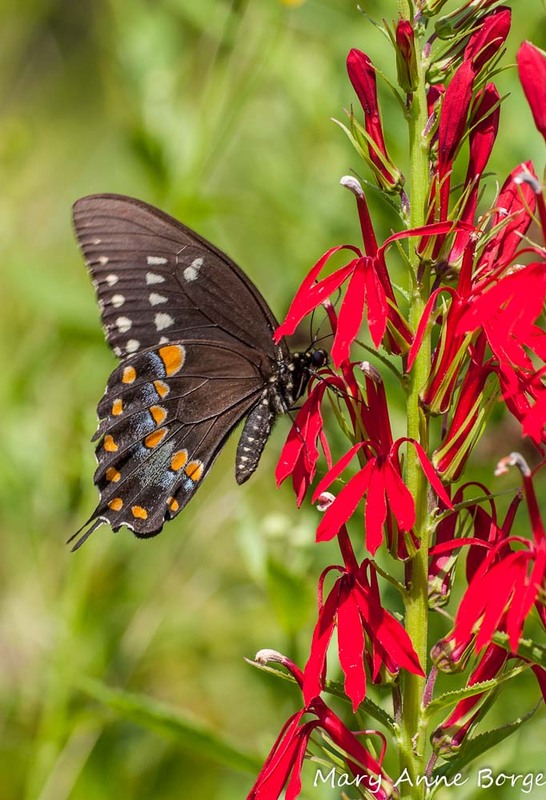 Is the Cardinal Flower a perennial? The photo is beautiful! Yes, Cardinal-flower is a perrenial; it will come back every year.